Ever wanted to know how to find the IP address of your computer? This simple tutorial will show you how to find your IP address, if you are using Windows. Your IP address is a unique number which identifies your computer on the Internet (just like how every household or business has a unique telephone number). Computers use this number to send data to a specific computer, similarly as you would send mail to a specific address and Post Code. Finding your computer’s IP address on Windows is fairly straight forward. 1. Click on Start --> All Programs--> Accessories--> Command Prompt . Alternatively, click on Start --> Run, type cmd and press OK. 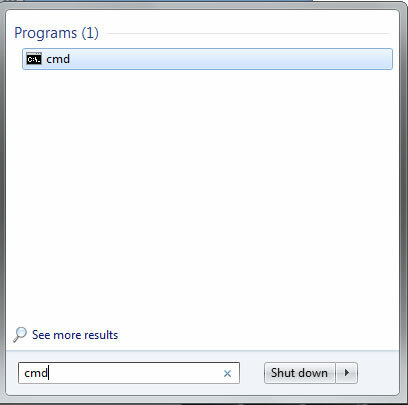 Window 7 users: Click on Start and type cmd in the search bar and press Enter. 2. In the Command Prompt window, type ipconfig and press Enter. This will list your IP address, Subnet Mask, and Default Gateway for computer. Your IP address is usually identified as the “Ipv4 Address” (See example below).